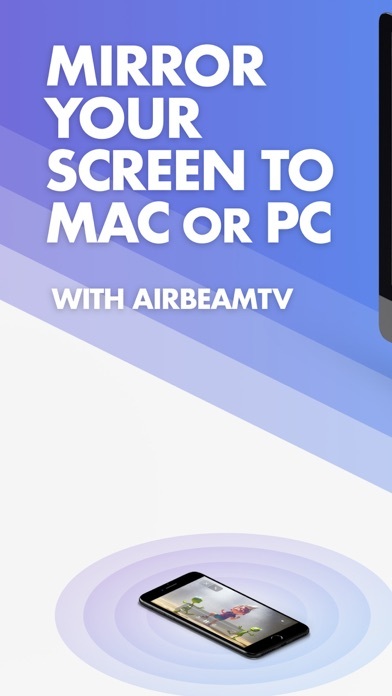 Application to mirror the screen and audio of your iPhone or iPad to your Mac or Windows PC. 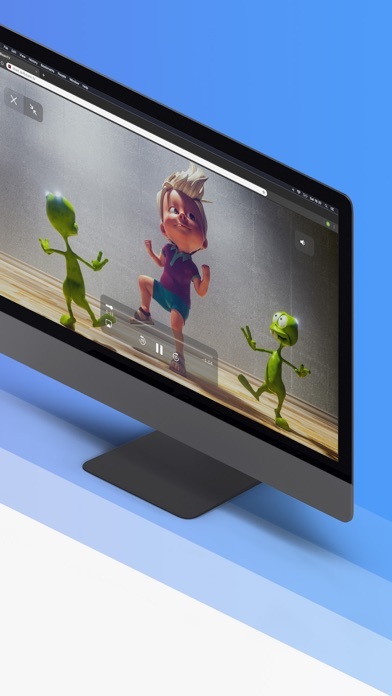 Works on any laptop or desktop with Windows (Windows 10, 8.1, 8 or 7) with the Chrome browser installed, or on any Mac, iMac, MacBook (Pro) with the Chrome browser installed. No wires and no additional hardware needed! And no need to install an application on your Mac or Windows PC, just use the Chrome browser! 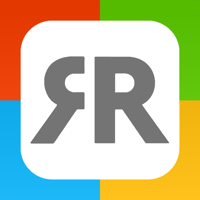 You can mirror any app on your iPhone or iPad to your computer. 1. 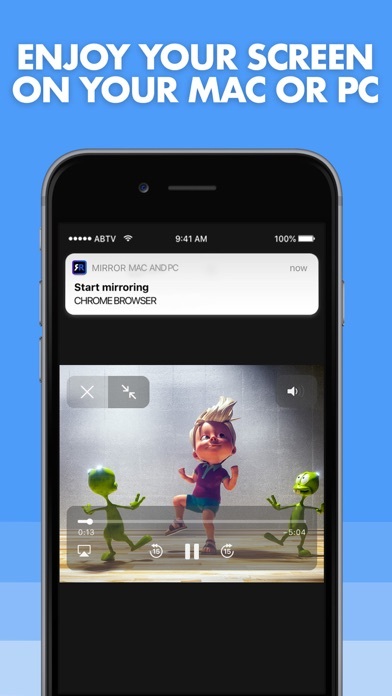 Launch the Mirror for Mac or Windows PC app. It will show a nine digit number. 2. Turn on notifications for this app. We will not spam you, but we will use this to let you know if screen mirroring is working correctly or not. So please, please allow it, otherwise when things don't work as they should, you are left in the dark. 3. 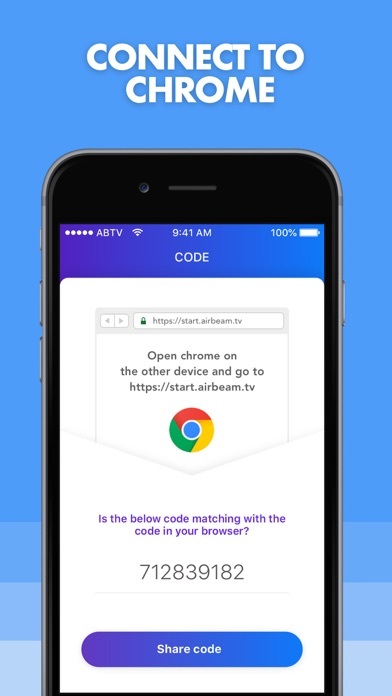 Open Chrome on your Mac or Windows PC and go to start.airbeam.tv and type in the nine digit number. 4. Click on Start Mirroring to start mirroring on your Chrome browser on your Mac or Windows PC. After that, you can just go to any other app on your iPhone or iPad and the mirroring just continues to run. 5. To stop mirroring, there are two options. (1) click on the red top bar that you will see on your iPhone or iPad. (2) Go to the Mirror to Mac or Windows PC app and click on Stop Mirroring. In Trial mode, the screen mirroring will continue for 5 minutes. After purchasing the premium version through an In App Purchase, screen mirroring will not stop after 5 minutes. 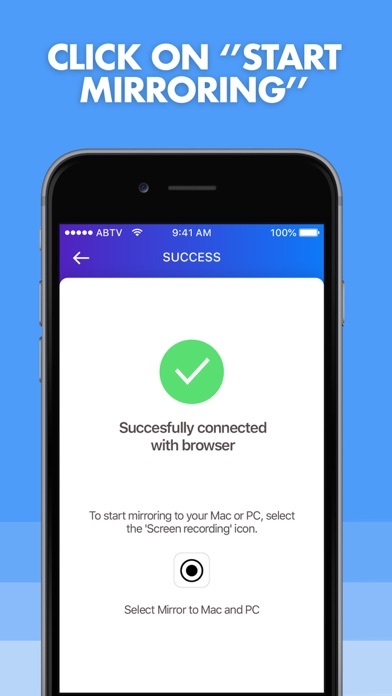 - When screen mirroring from Safari on your iPhone or iPad, there is no audio. We advice to use the Puffin Web Browser instead of Safari. Some apps don't allow screen mirroring. For instance Netflix: when you start screen mirroring when running the Netflix app on your iPhone or iPad, the computer screen will turn black. This is a choice that Netflix made; there is nothing that we can do about that. If you have questions or would like to provide feedback, please send us an e-mail or chat with us on via Facebook Messenger.